Biotin deficiency causes structural changes in the hair and nails. However, biotin deficiency is rare, because your gut bacteria actually make it. The people most likely to suffer from biotin deficiency include: those taking antibiotics for long periods of time; people eating raw egg white; and possibly anti-seizure medications. There’s no evidence that people with hair loss or changes in hair quality have benefited from biotin supplements. 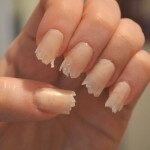 Nails may be another story. Human studies found that the overwhelming majority of women with brittle fingernails who took biotin (2.5 milligrams of biotin each day for up to 6 months) saw improvements in nail quality (i.e., less splitting and cracking). However, none of these were ‘controlled’ trials, so the jury is still out. Good food sources include whole wheat bread, avocado, raspberries, and cauliflower.